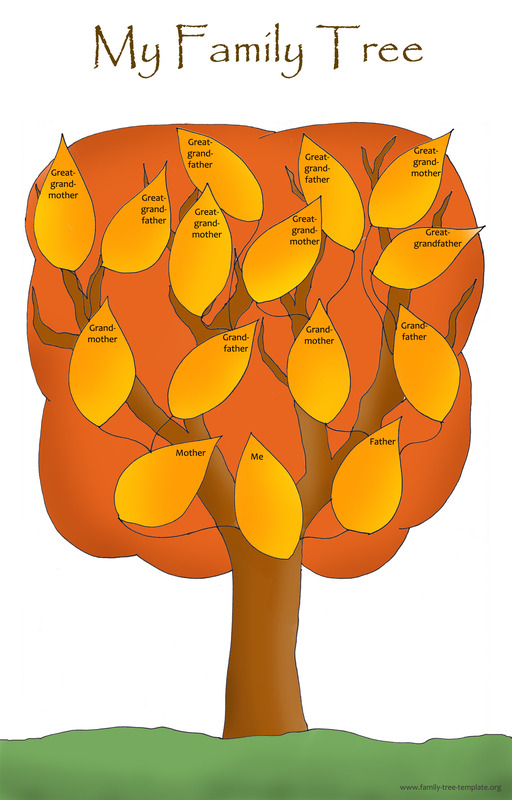 Welcome to this artistic family tree template website, the place where you and your kids can find all kinds of useful, original and not to forget high resolution templates to make a free printable family tree. 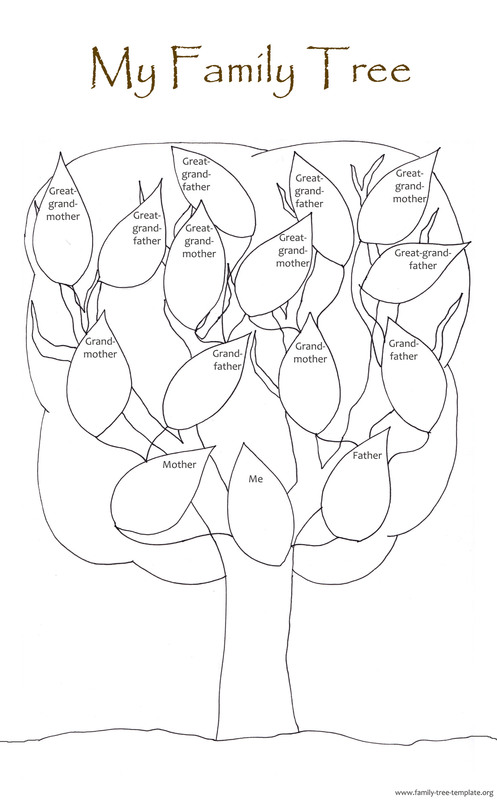 Besides printing out these family charts (for private use only, thanks), you can learn everything you want to know about making your ancestry chart so that you can get going with creating your family tree chart with all of the information about your family and its rich history. If you don’t know much about genealogy and how to find out about your ancestors, don’t worry! 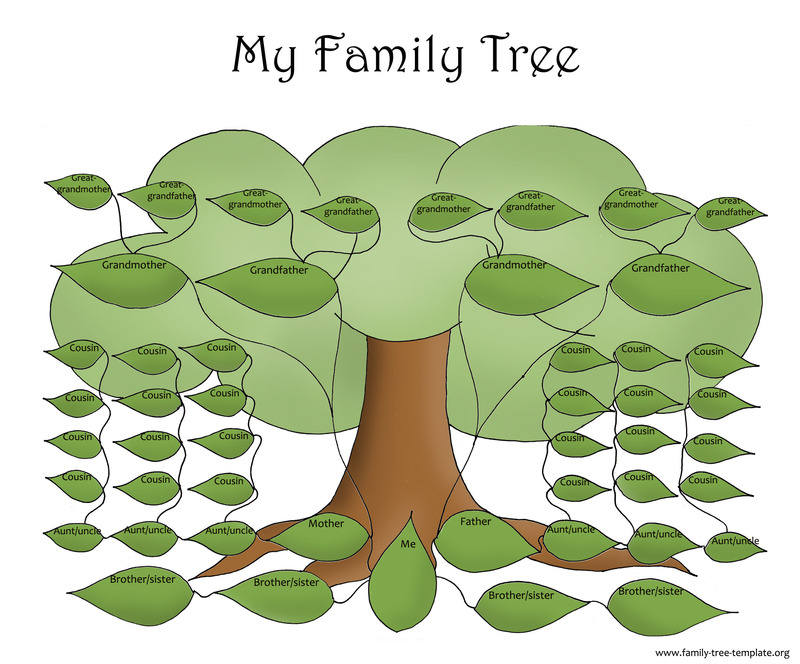 I’ve got lots of amazingly useful information on this page for you, so you will easily be able to use that information to make as simple or complex a family tree chart as you want. 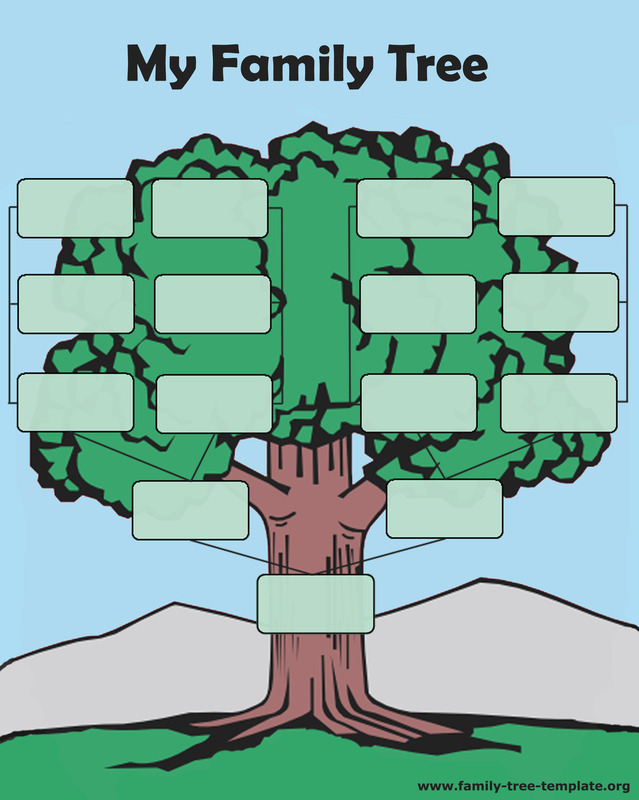 Check out the pages on this site to find as much information about making your own family tree template and chart, and you may just find that there is exactly what you need for this fun project. Good luck, and happy family mapping! –	Some all finished in colors, all ready to print out and insert family names into. 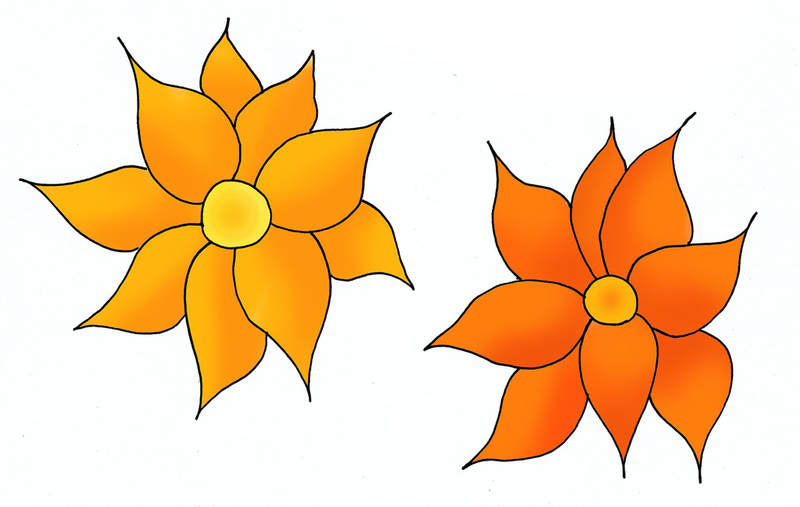 – Some as coloring pages for kids to color and then afterwards they can put in the names. Same size as the above image: 20 x 24,1 cm in 250 dpi. This tree is 18 x 20,67 cm in 300 dpi. Also really good print quality and perfect for A4. Size is the same as the image above: 18 x 20,67 cm in 300 dpi. Size is the same as the image above: 18 x 20,67 cm in 250 dpi. 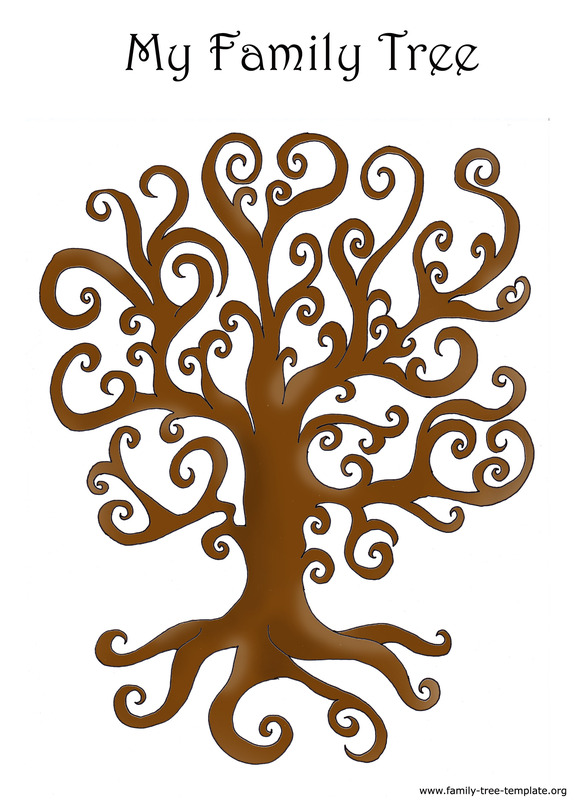 This very simple ancestor tree design is 27 x 19,6 cm in 250 dpi, perfect for printing. Even though this tree looks smaller on screen than the above ones, it isn’t. Like the ones above the image size is perfect for A4 in vertical position. This tree is 16,63 x 26 cm in 270 dpi. Almost the same size as the one above: 17,26 x 27 cm in 280 dpi. Almost same size as the one above: 16,78 x 27 cm in 250 dpi. Here you need a pair of scissors. 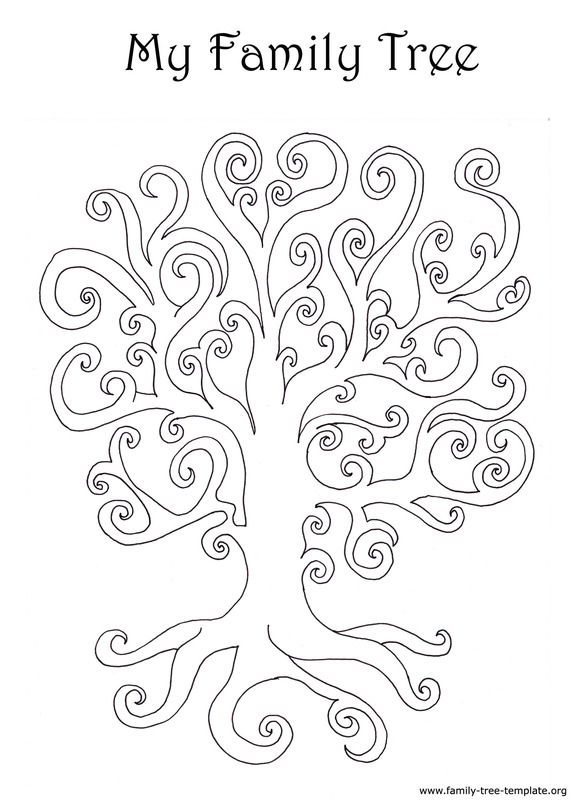 Print out the tree below and your preferred color of leaves (green/summer or orange/autumn) or if you prefer flowers instead, just print those out. 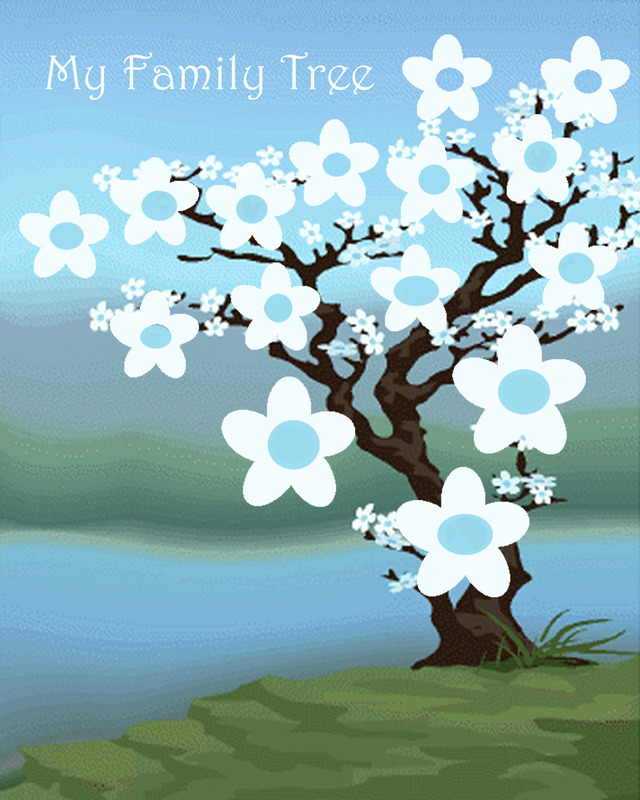 Cut out the leaves or flowers and glue them on to the tree and write the family names onto the leaves or flowers. 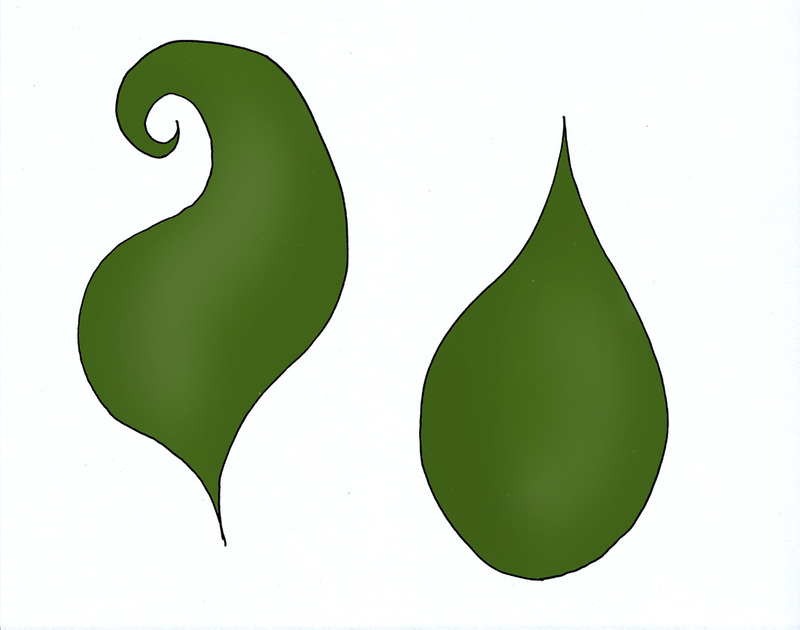 Even though these leaves above and the leaves and flowers below look relatively bigger than the tree above, they are not when you actually print them. They should fit perfectly on the tree above. When looking into the family tree template that you want to use, it’s important to remember that there are a few different types of charts that you can use. You can choose the simple family tree style, or you can get more complex and get into the professional charts that are made by renowned genealogists. The descendant chart is something that is used by many experts to trace the lineage from a specific person in the past to a person today. Say you think that you are directly related to Christopher Columbus. You will then use a descendant chart with good ol’ Chris at the top of the chart, and you will use the chart to map out each of his descendants in order to find the connection to you. You can trace the family line to you, but it will be a challenge if you don’t know how the famous person is connected to you. Usually you will have to have this information before you get started using a descendant chart. The famous person will go in the prominent position, rather than you. You will need to do a bit of research to find out if the person truly is your ancestor, and you will have to trace him down the line of his children, grandchildren, and so on until the connection between the two of you is established. This is like trying to find a way to connect two dots, and is a much more challenging type of chart – usually one best left for the professionals. Ascendant charts are the simplest kind, as they are putting yourself in the primary position and working backwards to find out who your ancestors are. They are the kind that most genealogists use to trace you family heritage, and you will find that they are a whole lot easier for you to work with. You place yourself at the bottom of the chart, and you slowly trace your ascendants backwards through history – beginning with your parents and grandparents of course. It will be much easier to put the puzzle together in this way, as you will be able to find out information much more easily when you work backwards from the present. This is a German chart (hence the German name), and it is usually used to trace ancestry. It will allow you to trace your ancestors in a specific order, which will ensure that you can find each of the people in turn. You begin with yourself, and you are given the number designation of 1. Your father has the number 2, and your mother has the number 3. Your father’s grandfather has the number 4, and your father’s grandmother has the number 5. Your mother’s grandfather and grandmother have the numbers 6 and 7 respectively, and so on and so forth. You will use the chart to number each of your ancestors, with the mothers receiving an odd number and the fathers receiving an even number. If you want to see an example of such an Ahnenfatel template, you can go here. 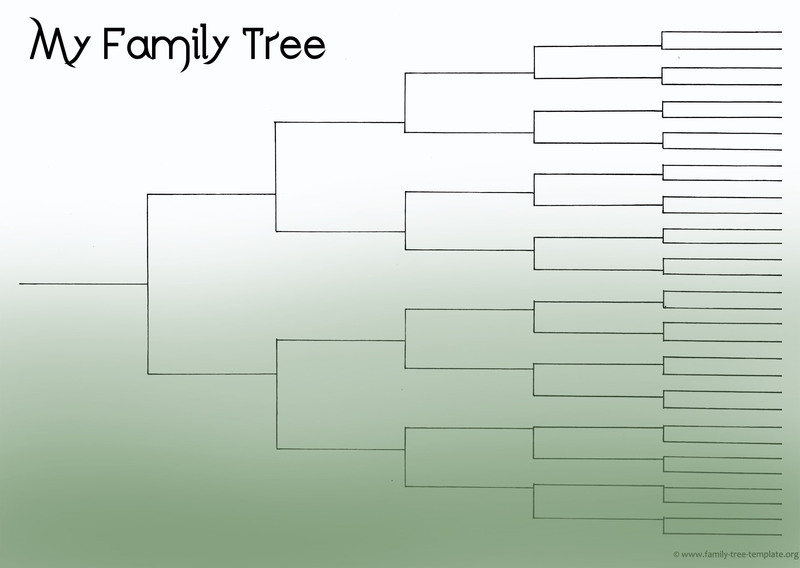 A pedigree chart starts out looking like a ‘normal’ family tree but it soon it gets more complex than that. You see, a pedigree chart will help you show how certain human traits are passed on from generation to generation thus showing how e.g. brown hair or blond hair works its way down the tree. Did you know that there is a handy tool that you can use to make mapping the information a lot easier for you? This tool is called a Family Group Sheet, and will help you to store all of the information about a specific family group – information which you will then include on your chart. This will make it easier for you if you are going to be doing research on a specific family group, such as your great great great great grandfather and his parents. You will be able to carry these sheets around with you, and you can use them to write down all of the information that you find as you do your research in the public libraries, records and archives, and online. Once you have found the information that you’re looking for on the specific family group, you can then take the sheets with you back to your chart (which is probably fairly large by now), and you can input the information from the sheets. It will make it easier for you to keep track of the people that you are researching, and will guarantee that you never lose the information that you have found! On this page on www.ancestry.com you’ll find a downloadable family group sheet along with many other kinds of research sheets, you may find handy in your research phase. Image size of this tree is 20 x 25,03 in 300 dpi – perfect for A4 printing. Image size of this tree is 20 x 20,56 in 280 dpi. This blank genealogy template is 24,53 x 20,01 in 250 dpi – a great fit for an A4 paper. This chart has the same size as the colored one above. This tree is 18 x 22,51 in 280 dpi – also good printing quality. Image size is 19 x 21,66 in 280 dpi. 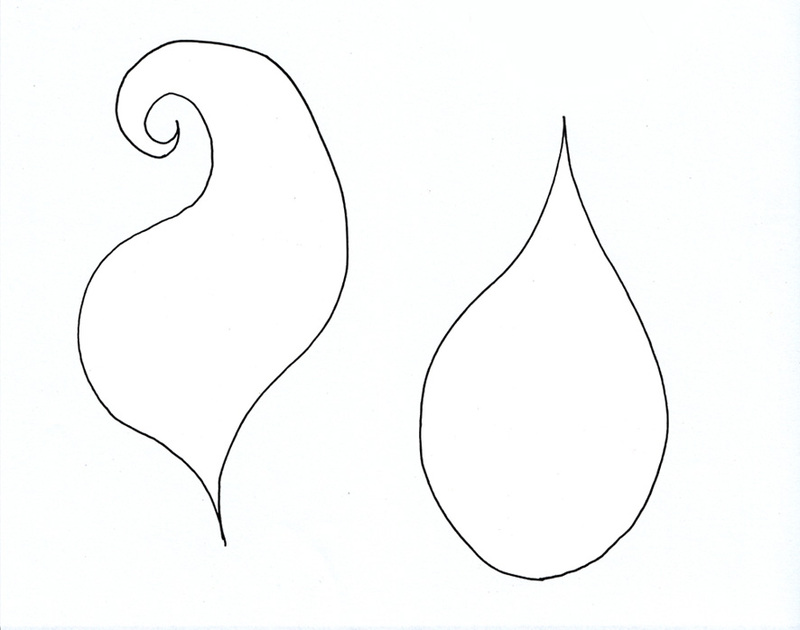 – Okay Now You Have a Bunch of Printable Templates but How Do You Go about It Now? 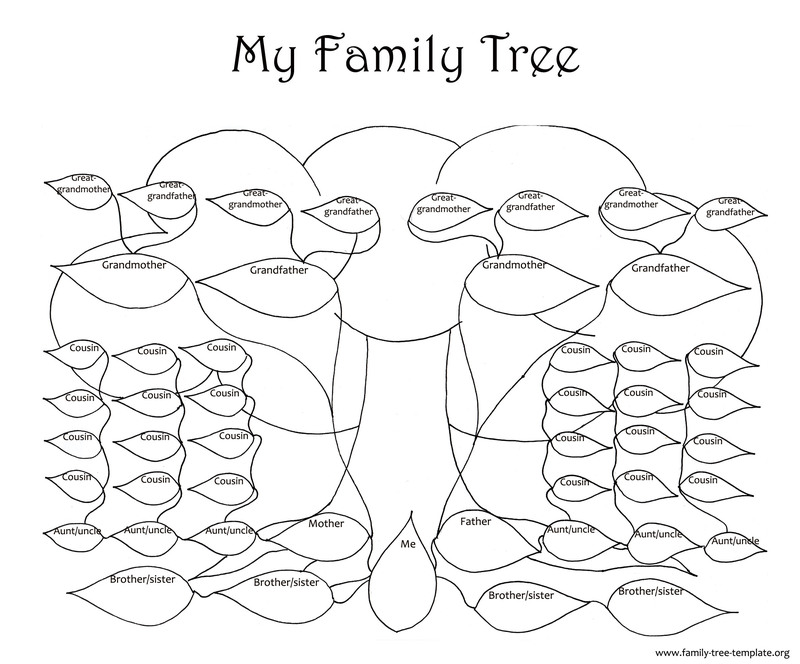 So, you want to start using a family tree template to make your own family tree chart? It’s actually going to be a lot easier than you might expect, but it’s important that you get started the right way. Remember that you’re going to need to print out all of the information that you are discovering about your family, and you will need to input all the information into the ancestry chart. If you want to make a fancy chart, you can download and print out a fancy one, or you can create it yourself using all your arts and crafts skills. 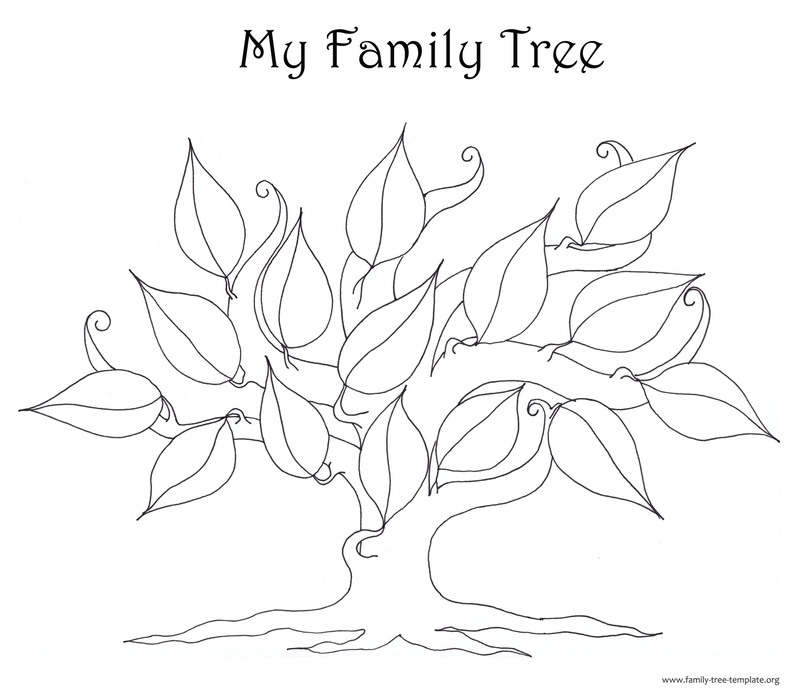 In order to prevent mistakes, you can find a free printable family tree, which you can fill out until you are sure that you have all the facts straight. Once you have everything, you can put the information on the fancy chart! Before you can start filling out the chart, you’re going to have to start digging into your past to find out about your ancestors. Obviously the place to start will be with your parents, and you can get their information quickly and put it down on the chart. You will then need to find out about the grandparents, great grandparents, etc., and this may require you to start talking to some of your older relatives if your parents aren’t sure of all the facts. You may be able to get your information straight from the documents of your ancestors, which your family has hopefully stored. At least you should start asking questions to your relatives and finding out as much as possible. There is always the off chance that your parents or grandparents have stored information or documents from your ancestors. This may include pictures with the name of your ancestors, birth certificates, tax liens, home information, and more. You may find that your grandparents’ attic will be a place of wonder, as they may have all kinds of awesome things that will help you to trace your ancestry back as far as possible. It’s important to dig through all of these documents and pictures, as they can be incredibly helpful in getting you started down the path to finding out more about your ancestors. It’s important that you know how far back you want to trace your ancestry, as that will ensure that you keep your eyes on the prize. If you just decide that you want to trace it back as far as you can, chances are that you will end up getting discouraged when you can’t find some information from hundreds of years ago. However, if you have a goal in mind, you will be able to start doing your research and checking out all the relevant information, but you will be able to focus on putting together the final pieces of your puzzle without getting discouraged about your lack of progress. This is just the beginning, but you will find that the past will open up to you as you spend time digging into it and researching the fascinating history of your family! If you’re planning on making your own family tree, the good news is that you have a lot of options available to you. 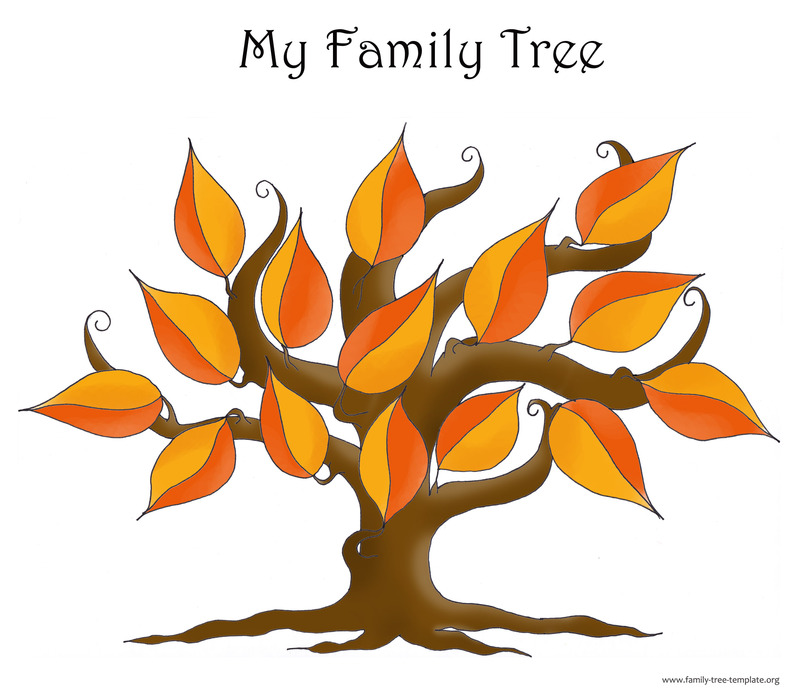 There are many tools that you can use to make the family tree, and you will find that these tools will make it a lot easier for you to compile all of the facts and research on your family. If you want something done right, it’s always recommended that you hire a professional to do it. You will find that working with a professional will ensure that your family tree is prepared a lot more quickly, and the information is much more likely to be accurate. This is because the professional does it for a living, so he will know where all of the best information is likely to be. It won’t be too costly, and it can be a good way to ensure 100% accuracy for your family tree. 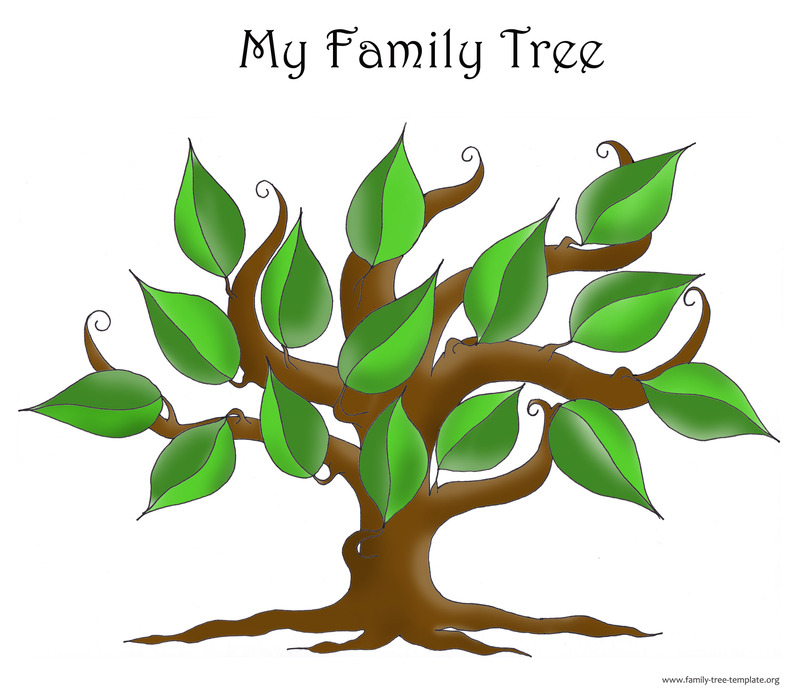 Another way to get your family tree done is working with all of the members of your family, as that way the load will be spread out with all of the other siblings and relatives that have a vested interest in finding out as much about their history as possible. It will be a lot quicker and easier if you have many hands and eyes doing the hard work and research, but it’s important that you organize yourselves properly if you’re going to work on it all together. The goal is that you all pitch in to help come up with the information to fill out your family tree, and the division of labor can help things to move much more quickly. 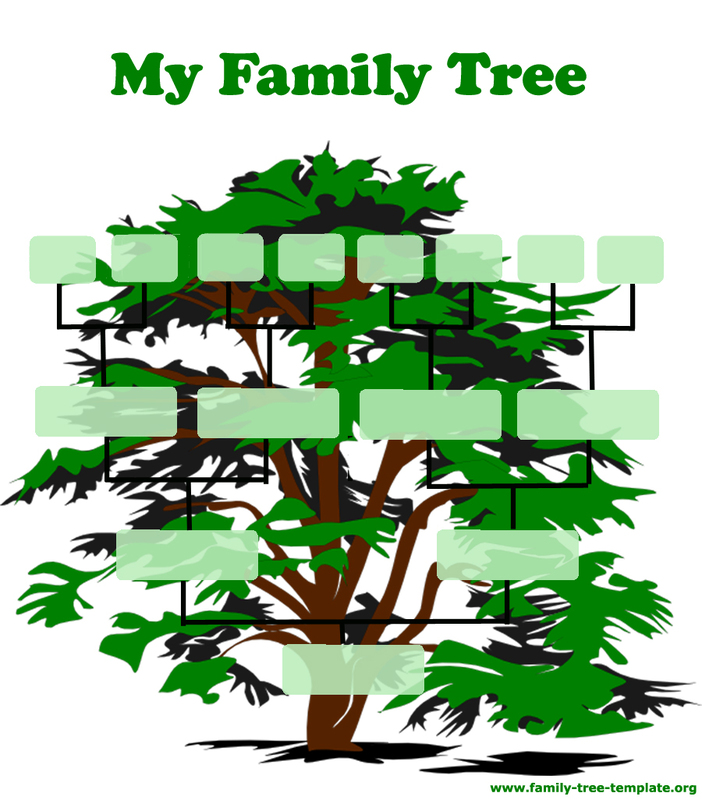 There are many sites where you can fill out family tree templates, which you can then download once they are filled out. These sites will often contain links to a number of archives and libraries where you can find information online, and this will be a good way to get access to all of the data you need to fill out your family tree. The templates are always easy to use, and they will provide you with blank spaces to fill in all of the information that you find on your relatives. For those who prefer using the computer to doing legwork, this is the choice for you. The good old fashioned way has rarely failed, and the truth is that you’re probably going to have to spend some time poring over books in libraries or visiting the public archives to find out more information in person. It will take a lot more time to get your hands on the information, but it will be worth it in order to have credible facts that are verifiable. It will cost you a lot more sweat and effort, but that’s what you signed up for when you took on the project of making the family tree, right? – Simple, Easy … and Pretty Too! 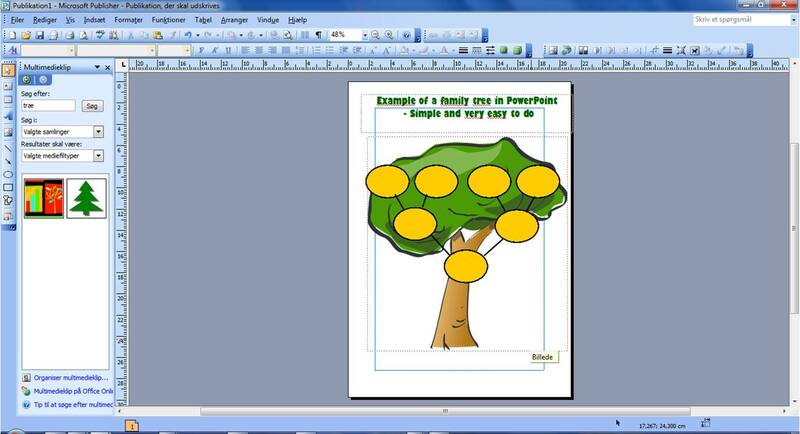 PowerPoint is a great tool that you can use to make a family tree template, and you will find that you can whip up your own blank template for genealogy charts and family trees in a matter of minutes. Step 1: Open a new blank document. It can be the standard document, as you won’t really need to animate anything. Step 2: Insert a picture – it can either be from PowerPoint’s own collection or maybe a photo of a tree that you have taken yourself. 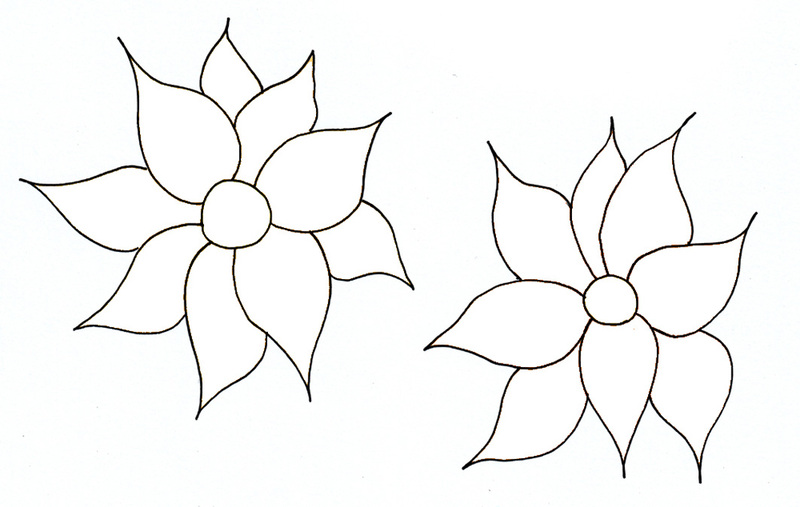 Step 3: Insert the shape of your choice, usually a square or circle. You can make the shape as fancy as you want, using the color, fill, and outline tools to help you give it the final shape and color of your choice. Step 4: Copy the shapes by pressing Control + C and paste them onto the document using Control + V, or hold down the Control button and drag the shape. Step 5: Make sure that you have a primary shape and two shapes directly above it, and use the text tool to input the people’s titles (mother, father, father’s mother, etc.) into the boxes. Step 6: Use the line tool to draw a line between each of the boxes, and copy the lines for each connection that you make. 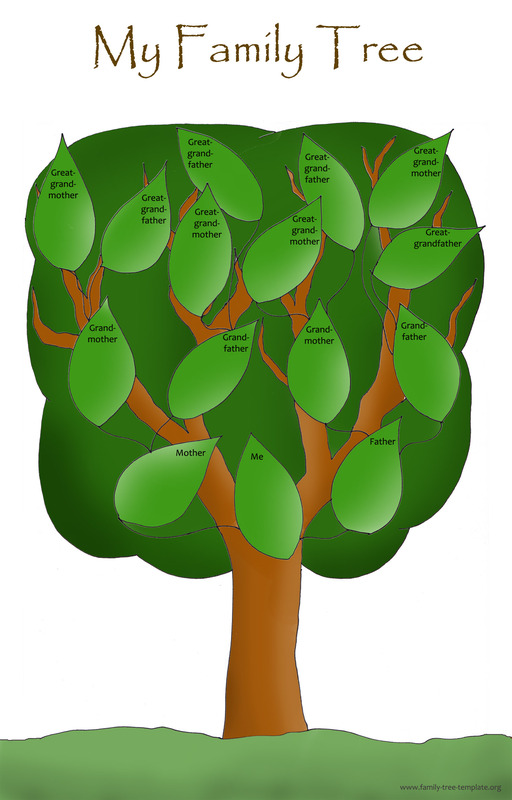 In just a matter of minutes you have made a simple family tree template that you can copy and expand as much as you like, and you can add as many family members as you want. Seeing as the program is so easy to use, you can customize your family tree template as much as you want, and you can make it simple or fancy – it’s up to you! This is an excellent pastime, and it will open the doors of history to you, so happy charting. But Why Genaology in the First Place? Genealogy is a popular hobby for many people, and it can be an amazing way to spend time finding out more about your family and its rich history. There are many people around the world that indulge in a bit of research into their family’s history, and they find out a whole lot of amazing things about themselves and their heritage. It’s a fascinating hobby – If there is one thing that is fascinating, it is finding out about you family and its history. Perhaps your grandfather won a medal for his bravery in World War I or World War II. Maybe your great, great, great grandfather was around when the Declaration of Independence was signed, or your ancestors were on the Mayflower when it sailed into Plymouth Rock. You may find out all kinds of amazing facts about your family, and few other hobbies are more fascinating to history buffs! 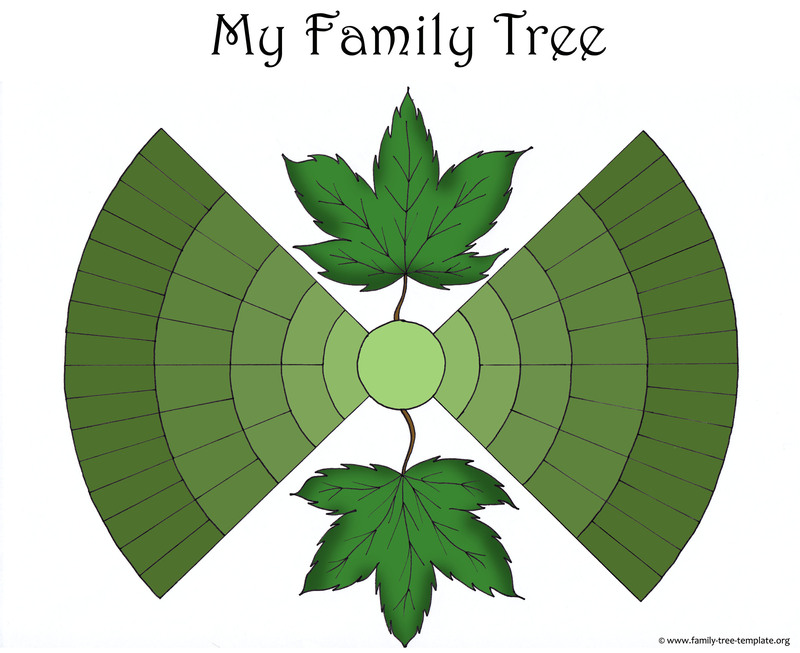 It’s a great stress reliever – Just like doing a puzzle, creating your own family tree and ancestry chart can actually help to give you an output for your energy and stress. Rather than coming home all tired, you can spend a bit at the library doing research into your family history. Just like you feel triumph when you finally find that tough piece that you’ve been missing in your puzzle, so too you will experience the same feeling when you finally find the birth and death information for one of your great ancestors. It can help to eliminate stress, and will be a lot of fun. It’s good for your mind – Doing research isn’t only going to benefit you as you make your family tree, but you will find that your mind will develop and become a lot sharper thanks to the fact that you are spending time poring through books and records. You will find that you can read and comprehend facts a lot faster, and you will gain valuable skills that will aid you in any research that you do later in your life. If you can develop the research skills that will help you to create your family tree, you will find that any other kind of research you do in the future will be much easier. It’s good practice with the computer – Many people dislike using computers for genealogy research, as they find that the databases and archives available online are very complex. However, did you know that Google has access to a whole lot of information, information that you will need for your research? If you want to be more effective in your research, you’ll need to use the computer. The time you spend on the computer will help to develop your computer skills, which will come in handy no matter what you do! It will teach you a whole lot – If you want to learn about history, there is no better way to do so than studying your genealogy. If you find out that your grandfather was fighting in Iwo Jima, you will never forget the dates and locations for the battle. If you find out that one of your ancestors was on the ship with Columbus, chances are you’ll always remember the day that Columbus sailed. You can learn a whole lot of fascinating facts about history, and you will find that your memory of historical facts and trivia will be greatly improved thanks to the time you spend working on your family tree template. It may qualify you for different things – You may not find out that you are the nearest relative to a Duke who is going to die and leave you a castle as an inheritance (this isn’t a Hollywood movie), but you may find that you are qualified for different societies or groups. If you have a Native American ancestor, you may be qualified to join a society of these fascinating people. You may be able to trace your lineage back to the American Revolution, which will qualify you to join groups like the Daughters of the American Revolution. You’ll never know until you find out who your ancestors are. The truth is that tracing your heritage and family history is going to be fascinating, and it will be very similar to doing an incredibly interesting puzzle. You will be able to trace your family back a couple of generations easily, but then it’s going to take a bit of sleuthing and researching work in order to find out more. It will be an amazing way for you to find out more about where you come from, and you may just be surprised at what you find when you put the pieces of your family’s puzzle together! 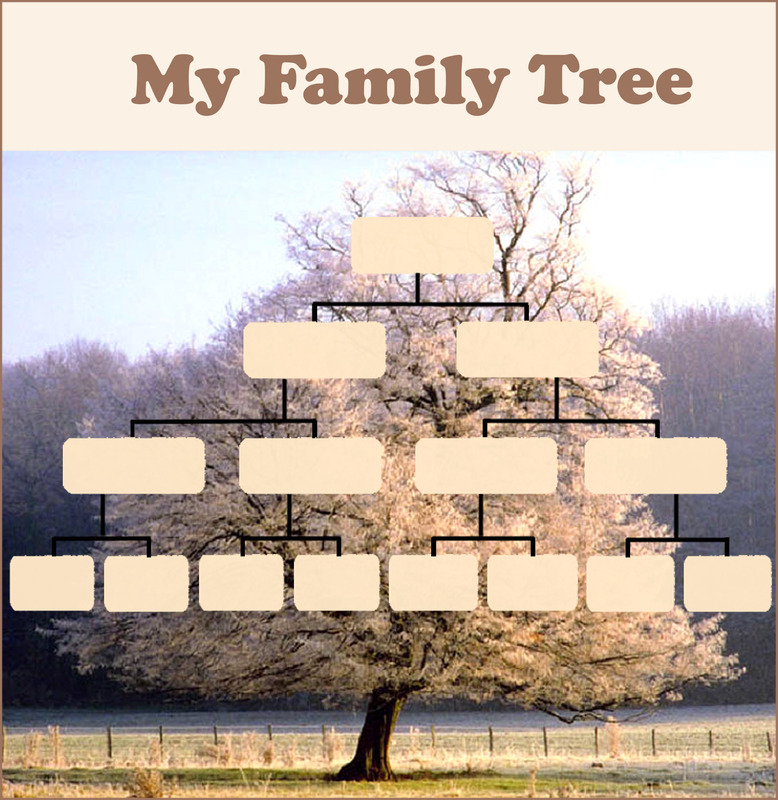 Want to know how to fill in the information in your family tree? 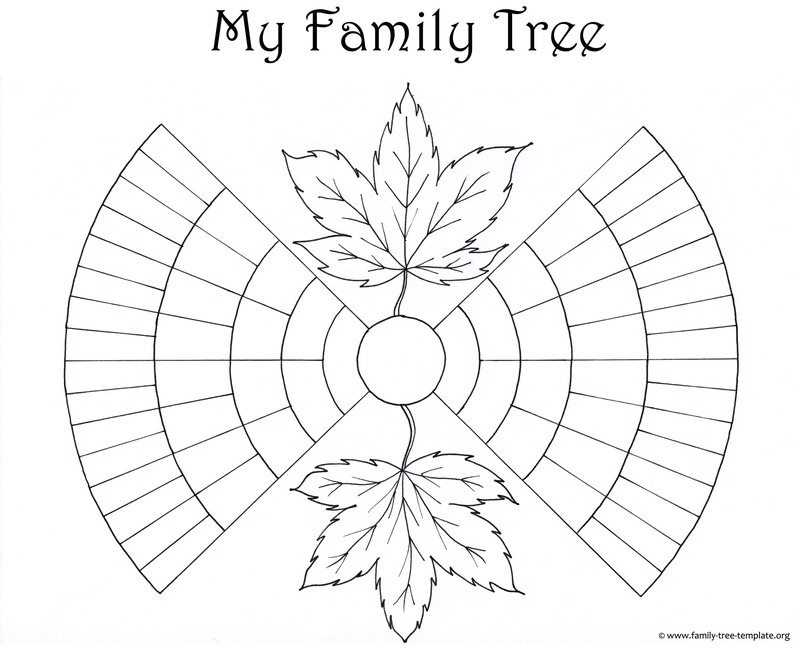 The Free Family Tree Forms page will give you all the tips you need to make filling out you chart easy and quick!